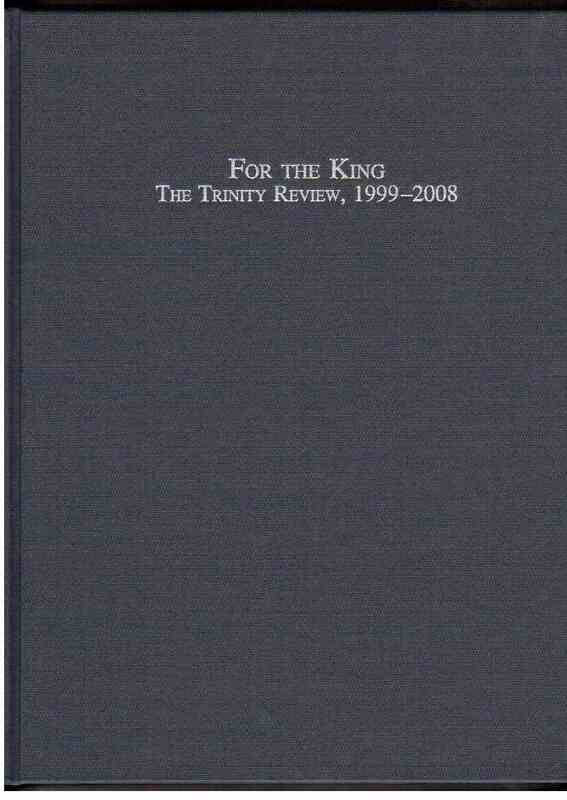 This is the third volume of essays from The Trinity Review, covering its third ten years, from 1999-2008. This volume, like the first two (Against the World and Against the Churches ), is fully indexed and is very useful in research and in the classroom. Authors include: Gordon Clark, J. Gresham Machen, John Robbins, Gary Crampton, Robert L. Reymond, Paul M. Elliott, David Englesma, O. Palmer Robertson, Mark Karlberg, Louis DeBoer, Peter Masters, Sean Gerety, Kevin Reed, and Godwell Chan. Contents: Foreword; A Biblical Theodicy (Crampton); A New Systematic Theology of the Christian Faith (Crampton); We Have Seen the Future and We Are Not In It (Van Kleek); The Embarrassing Mr. Kuyper or Playing Politics - Pragmatism - Is Inimical to Christianity (Robbins); Achaeology and the Bible (Climer); Antichrist 1999 (Robbins); Beware of Men (Robbins); Protestant Pastors on the Road to Rome (Altham); The Gospel is the Power of God (Robbins); The Reformation Day Statement; The Reformation Day Statement vs. World Magazine (Robbins); Why Does Rome Teach What It Does About Justification? (Reymond); The Failure of Secular Economics (Robbins); Intellectual Dishonesty and Roman Catholic Apologetics (Robbins); The Sin of Signing Ecumenical Declarations (Robbins); The Path to the Future: Washington College Academy Founder's Day Address (Robbins); Van Til's Apologetic: Readings and Analysis (Crampton); The Promise of Christian Economics (Robbins); Chuck Colson (Robbins); A Guide for Young Christians (Robbins); Five Points (Chan); Evangelism (Chan); The Changing of the Guard (Karlberg); John H. Gerstner on Thomas Aquinas as a Protestant (Reymond); A Call for Christian Rationality (Crampton); Compassionate Fascism (Robbins); False Shepherd: The Neolegalism of Norman Shepherd (Robbins); Justification and Judgment (Robbins); The Binding of God (Englesma); Conservatism: An Autopsy (Robbins); Christian Exclusivism (Crampton); Pied Piper (Robbins); The Gospel of Christ versus Neolegalism (Robbins); What's Wrong with Islam? (Reymond); Christ and Civilization (Robbins); Rethinking the Apostles' Creed (Loucks); The "Very Pernicious and Detestable" Doctrine of Inclusivism (Reymond); The Current Justification Controversy (Robertson); The Heresy Matrix (Robbins); Did C. S. Lewis Go to Heaven? (Robbins); What Is Saving Faith? (Clark); Biblical Principles of Giving (Robbins); The Biblical Covenant of Grace (Robbins and Gerety); Against Christianity (Robbins); Original Manuscripts, the Majority Text, and Translations (Crampton); "In Christ" (Robbins); Forgotten Principles of the Reformation (Robbins); Saving the Bible Presbyterian Church (Evans); Can the Orthodox Presbyterian Church Be Saved? (Robbins); The Biblical View of Truth (Robbins); The Justification Controversy: A Guide to the Perplexed (Robbins); Why Heretics Win Battles (Robbins); The Evisceration of the Christian Faith (Gerety); The Marks of Neo-Liberalism (Elliott); The Clark-Van Til Controversy (Hoeksema); Federal Vision (Englesma); Lessons for the Lads (McElwain); Calvin on the "Pernicious Hypocrisy" of Justification by Faith and Works (Reymond); Inquisitions, Confessionals, or Courts (Robbins); Who Really Owns the "Holy Land"? (Reymond); The Religious Wars of the Twenty-First Century (Robbins); The Orthodox Presbyterian Cover-up (Elliott); Sacramental Sorcery (Robbins); Providence and Thanksgiving (Robbins); Linguistics and the Bible (Perkins); The New Perspective on Paul (DeBoer); R. C. Sproul on Saving Faith (Robbins); Faith in Hebrews 11 (Crampton); What Should True Presbyterians Do at the 1936 General Assembly? (Machen); Counterfeit Miracles (Robbins); Words (Robbins); In Defense of Theology (Clark); The White Horse Inn: Nonsense on Tap (Robbins); The Law of a Sound Mind (Masters); God's Will and Healing (Robbins); Roman Catholicism's Recent Claim That It Is the True Church (Reymond); Apparitions and Roman Catholic Doctrine (Kauffman); Antichrist is Coming, April 15, 2008 (Juodaitis); The Bible and Women Teachers (Crampton); Imperious Presbyterianism (Reed); The Logos (Clark); Christian and the Civil War (Robbins); The Bible As Truth (Clark); Index; Scripture Index.